We have amended our beds, laid out rows and are now ready to sow seeds. 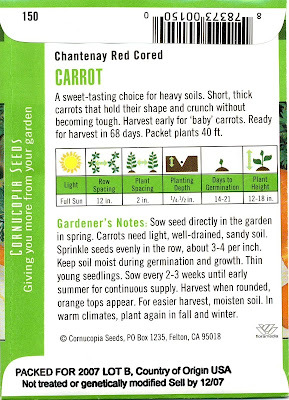 All pertinent information about planting seeds can be found on the back of the seed packet. This includes: lighting requirements, row spacing, plant spacing, planting depth, plant height, days to germination, and days to harvest. Note: On the seed packet row spacing refers to traditional row crops. In a raised bed we don’t need space to walk through our rows, so we plant more intensively (closer together). Also, pay special attention to plant height, remember taller plant go at the north end and smaller plants at the southern end, this way your plant are not shading one another. 1) Radishes – Perhaps not the tastiest of vegetables but certainly the quickest; seed to harvest is 30 days. Students will feel a sense of accomplishment that far outweighs any nutritional or educational benefit. 2) Lettuce – One of the easiest vegetables one can grow. Stagger your planting (sow seeds Oct, Nov, Dec…) and you’ll have lettuce all year. Also, more importantly, lettuce seed sown now will go to seed within the school year. If you wish to demonstrate the life cycle of a plant, lettuce is perfect (so is Cilantro). 3) Peas and Carrots – Good companion plants in the garden, and in the kitchen. Peas are like nature’s candy and carrots are a thrill to harvest. 4) Fava Beans – Dual benefits, first, they grow well in the fall and can be used in many bean recipes and second, fava bean plants add nitrogen to the soil benefiting the crops that follow it. 5) Swiss Chard – Winner of the most-bang-for-your-buck award. Sow seeds in the fall, harvest only the outer leaves, and you can enjoy Swiss chard the entire year. For complete list of what you can plant now see my chart of Vegetable Families and the Digital Gardener’s Southern California Vegetable Planting Schedule.